As the long summer days slowly blend from one into another and out-of-school boredom starts to set in, we find ourselves looking for new ways to amuse ourselves with crafts. You know what our favorite craft is these days? Polymer clay*! It’s easy to work with and you can make just about anything with it. Plus, it comes in about three billion colors which is right up my daughter’s alley. First knead your clay in your hands until it is soft and pliable. Then roll it out with a rolling pin or plastic drinking cup until it’s about a quarter inch thick. Next portion it into roughly 1 inch sections. 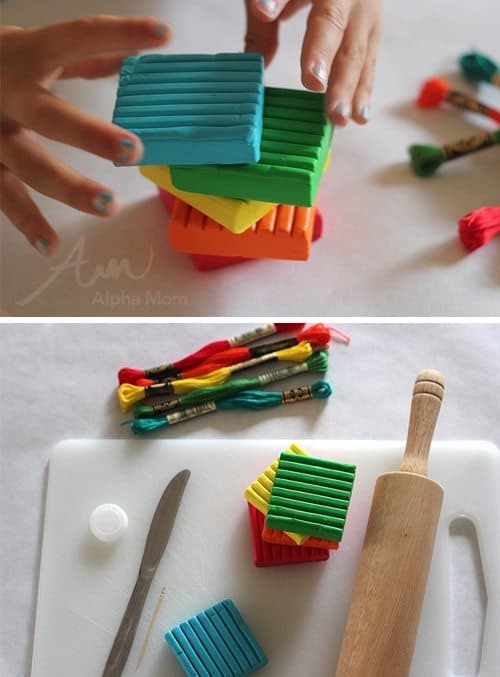 We did this the hard way and used a bottle cap lid (because we had a different craft in mind that went sideways) but you could easily just cut it up into small equal squares using a butter knife. Next take those small sections and roll them into little balls. Then, guess what you do next?! Squash them flat with your thumb! That’s why they are called thumbprint beads. We like to think how cool it is that you have your own individual mark on every single bead. You can trade them with your friends even and create a friendship circle of thumbprints! After they are all squashed (feel free to smooth out rough edges with your fingers) take a toothpick and press a hole into each bead. Wiggle it around a little bit so that they are easy to thread. Then transfer each bead to a cookie sheet and bake at 275º for 15-20 minutes. (Please follow all the directions closely with your polymer clay. Overcooking polymer clays can release toxic chemicals into the air. Also keeping the kitchen well-ventilated is always a good idea. This craft should be done only with a responsible adult present). 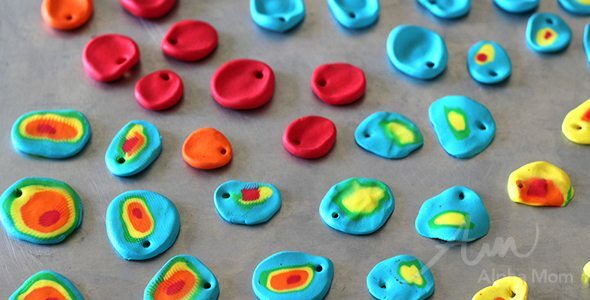 Were you wondering how we made the super cool weather doppler beads? We rolled out a snake for our center color then wrapped it with the next color and another color so it was like a jelly roll of rainbow-colored clay. Then we sliced the roll with a knife in small 1-inch segments and squashed them with our thumbs (smoothing out the edges with our fingers). Easy peasy and oh-so-cool looking. Just imagine the color possibilities! After you bake your beads, let them cool and make necklaces! Friendship necklaces for everyone, even the pets! Happy Summer Crafting! Hope you have as much fun making these as we did! * As mentioned above, please follow all the directions closely with your polymer clay. Overcooking polymer clays can release toxic chemicals into the air. Also keeping the kitchen well-ventilated is always a good idea. Cute! I recall making these at summer camp when I was a kid. Except I think we just had gray clay and had to paint them!